The government has cancelled till July 15 the leave of all employees of the Irrigation and Public Health Department right from a fitter to executive engineers in view of a serious drinking water crisis, said IPH minister Ravinder Thakur here today. The Irrigation and Public Health Department is all set to go online and introduce management information system to ensure efficient functioning right from the office of the engineer-in-chief down to section and scheme levels. People in the lower areas of the state had some respite from the heat wave conditions after thundershowers lashed several areas of the state last night following which the day and night temperatures across the state plummeted sharply. 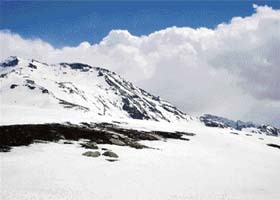 A view of the snow-covered Rohtang Pass. Chief Minister P.K.Dhumal warned today that water scarcity and other environment-related problems were bound to get aggravated unless effective steps were taken to reverse the process of global warming and asserted that the Centre must compensate the hill states that were playing a vital role in reducing greenhouse gases by maintaining forest cover. A doctor trained in care of critical patients will now accompany patients referred to the PGI or other medical institutes from the Indira Gandhi Medical College here. With super-specialties in many faculties yet to develop at the IGMC, critical patients have to be referred to the PGI or other bigger institutes. Senior RSS leader Indresh Kumar said today that freedom of Tibet was essential from India’s security point of view as it was only after Chinese occupation of Tibet that there was threat and uncertainty on the borders. The launch of the Indira Gandhi national age pension scheme by the UPA government is a laudable step but a lot more is required to be done, particularly at the level of states, to provide social security to the elderly poor and make their lives less problematic, says chief executive of HelpAge India, Mathew Cherian. The BJP said today that the Congress was trying to divert the attention of the public from issues like price rise by indulging in a derogatory campaign against senior BJP leaders, including Chief Minister P.K. Dhumal and Shanta Kumar. Chief Minister Prem Kumar Dhumal said here today that his government was committed to providing subsidised ration to the people and had already allocated necessary funds for this scheme in the Budget. He claimed that an adequate stock of ration was available in all fair price shops. The World Bank is unhappy over the tardy progress being made on the environment front by the ecologically fragile hill state, particularly in the implementation of the catchment area treatment (CAT) plans, and wants the state to come up with a master plan for the purpose. The Parwanoo police today arrested Sunder Lal, owner of M/S Jagdamba Oil Company, Shimla, after the high court denied anticipatory bail to him. He was wanted in a case relating to the alleged black marketing of 11,000 litres of kerosene. Various organisations have demanded that the state government should conduct a fresh survey in the town and review house tax imposed by the municipal council. According to these organisations, residents have been paying ‘electricity tax’ through bills issued by the Himachal Pradesh State Electricity Board. Six candidates have filed their nomination for the Hamirpur byelection after the last date for submitting the papers ended today. Those who have filed their nomination are: Anurag Thakur and his covering candidate Praveen Sharma (BJP); O.P. Rattan and his covering candidate, Ranjeeet Singh Verma (Cong); Independent Amin Chand and BSP candidate Rattan Chand Kaundal. Chief secretary Ravi Dhingra reviewed the preparations for the forthcoming Hamirpur byelection at a meeting held here today. He said 1,373 polling stations had been set up. These included an auxiliary booth. A company of Central paramilitary forces would be deployed for guarding EVMs and the election material. The police has contacted forensic experts, archaeologists and cultural experts to ascertain the antiquity of the human skulls found on the premises of the 383-year-old Kamlah Fort yesterday. All nine accused arrested in connection with Trishana Negi suicide case were produced in a court that remanded them in judicial custody for two weeks. These persons include teachers, students and other employees of the Himalayan Institute of Dental Sciences, Paonta. Rajinder Kumar (32), a resident of Jukhala, Bilaspur district, was killed on the spot at the Pung locality of Sundernagar town in a road accident yesterday night. According to information, he was coming back around 12.15 am after unloading the clay at the Kol Dam site and when he reached at Pung on the National Highway No. 21 he could not negotiate the tipper no HP-59-1018, which was being driven by him at excessive speed. Lightning killed a newly married couple at Dahar village on the boarder of Chopal subdivision this morning. Those killed were Jagdish, a resident of Heeda village, near Kupvi, and his wife, Kubja. Their marriage had taken place only a week ago. They had come to Kubja’s native village Dahar in Sirmaur yesterday. The Jawali police booked a cheating case against Sham Lal of Galua village under Nagrota Surian police chowki last evening for allegedly collecting lakhs of rupees from 150 depositors in the name of a so called private Time Way Multi Marketing company based at Delhi. It also failed to return the deposited money and any incentive as promised by the accused. Chief Minister Prem Kumar Dhumal inaugurated State Veterinary Hospital here today. Equipped with all modern facilities to cater to the health requirements of animals and birds, the hospital has been completed at a cost of Rs 1.72 crore. Naresh Thakur has been nominated as the Bhojan Serwa Samaj party (BSSP) state chief by the party high command today. Though over 85 per cent villages in the state had been provided with potable drinking water the state was facing a shortage of water to the extent of 25 per cent to 30 per cent. The government planned to provide potable drinking water to all villages by March next year. Besides, over 8,000 villages in the state were getting inadequate supply of drinking water. Therefore, water supply schemes in these villages needed augmentation. The minister disclosed that out of total 45367 villages in the state, only 500 were without potable drinking water. To cover these villages the government planned to spend over Rs 200 crore under a time-bound project by March, 2009. All executive engineers had been directed to visit the areas suffering from a water shortage. Water tankers had also been pressed into service to provide water. The IPH Department had been asked to launch a programme to make functional all hand pumps and restore traditional water sources. New hand pumps would also be installed. The Irrigation and Public Health Department is all set to go online and introduce management information system (MIS) to ensure efficient functioning right from the office of the engineer-in-chief down to section and scheme levels. It will enable the department to manage grievance monitoring, personnel management information and work management information system online to help provide better services to the people. This was stated by irrigation and public health minister Ravinder Ravi while addressing the inaugural session of a two-day workshop on management information system today. The workshop was organised in collaboration with the National Informatics Centre. Under the Rajiv Gandhi National Drinking Water Mission (RGNDWM), a Rs 6.5-crore MIS project had been approved for the state. A sum of Rs 4.2 crore had been received so far whereas the remaining amount was likely to be released soon, he said. With the introduction of the MIS, the receipt and disposal of public grievances and complaints would be expedited and it would also bring transparency in the working of the department as all information would be available on the website of the department. The minimum temperature at Shimla settled at 11.5°C, while the maximum temperature fell to 20.7°C after 7.2 mm overnight and early morning rains. Yesterday, the state capital had recorded the hottest day of this summer at 28.7°C and the warmest night at 18.8°C. The maximum temperature at Una town dropped by five degrees to 37.4°C from yesterday’s high of 42.8°C, which was the highest temperature of this summer season. The Met office said the maximum temperature at Dharamsala fell by about nine degrees to stand at 26.8°C as compared to 35°C recorded yesterday. Kalpa in Kinnuar district also recorded a fall in the minimum temperature, which stood at 6°C, as compared to 7.1°C recorded yesterday. However, the minimum temperatures at Sundernagar and Bhuntar rose to 19.1°C and 15°C respectively, the office said. Both these places also recorded 1.1 mm and 1 mm rains since last night, the Met office said. The higher altitude areas of the tribal districts of Kinnaur, Chamba, Kullu and Lahaul-Spiti also experienced fresh spell of mild snowfall since last night and early today. Launching a “sustainable campaign to clean the Queen of Hills” here he said that under the Kyoto protocol carbon credits were available for reduction of greenhouse cases and on the same analogy the hill states that sacrifice the much-needed forest revenue in the larger interests of the country must be compensated. The rate at which glaciers were melting would land the country in a serious water crisis. All possible steps must be taken to tackle the problem before it was too late. Regarding the plans to solve the water problem of Shimla he said a Rs 735-crore project had been formulated to bring water from the Pabbar river in Rohru. The government was seeking funds from the Planning Commission for the project which would help save power worth corers of rupees as water would be brought through a gravity line and no pumping would be involved. His government was aware of the problem and it had recently introduced a scheme under which CFLs would be supplied to over 16 lakh domestic power consumers free of cost. It would not only reduce the electricity bills of consumers but also enable the state to earn carbon credits. Lauding the effort of the local municipal corporation in launching a sustainable campaign to keep the city clean he said that it must become a habit with the people. 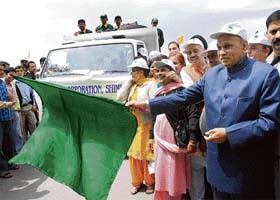 Dhumal also formally launched a door-to-door garbage collection scheme. The scheme was being implemented in partnership with five NGOs. The committee had given five dumpers to these organisations for the purpose. Transport and urban development minister Krishan Kapoor said that the previous Congress government misled the people on the Jawahar Lal Nehru Urban Renewal Mission by harping on Rs 3,900-crore plan as the state had received only Rs 20 crore. The present government would take up the matter with the Centre afresh and seek more funds for which 13 projects had already been submitted. Mayor Narinder Kataria gave the details of the campaign, which would conclude on June 30. A doctor trained in care of critical patients will now accompany patients referred to the PGI or other medical institutes from the Indira Gandhi Medical College (IGMC) here. With super-specialties in many faculties yet to develop at the IGMC, critical patients have to be referred to the PGI or other bigger institutes. To begin with the IGMC has appointed three house surgeons who will work in the casualty and gain experience in dealing with critical patients. “As and when there is need for a critical patient to be accompanied by a doctor while being shifted from IGMC to PGI or some other place, the doctor trained in critical care can go along,” said Dr S.S. Manhas, senior medical superintendent. The IGMC has one trauma van and another critical care ambulance donated by the Rotary. The two vans have all ICU facilities like oxygen, ventilator, monitor etc. The fact that the IGMC only has one six-bedded intensive care unit with no separate ICUs in other departments, there is a lot of pressure. It is for this reason that very often patients, especially from some departments like neurosurgery, are referred to the PGI or other hospitals. Major units like surgery, medicine and casualty will be given two to three high-dependency beds so that till a bed is available in the ICU they can get proper care. He was speaking at a function organised by an NGO, Himalaya Parivar, of which he was a secretary general. “Autonomy might be acceptable to the Tibetan spiritual leader, the Dalai Lama, for various reasons but we are in favour of complete Independence,” he said. Even if Tibet gets autonomy, its foreign affairs and defence would be under Chinese control and this would be a cause of concern for India. “It is also in the interest of those living inside Tibet and suffering Chinese atrocities and those leading life of refugees in India and other countries that Tibet gets its status of a free nation back,” he remarked. “We also need to give a befitting reply to those who are trying to misinform people and make propaganda that like Tibet people in Jammu and Kashmir and Nagaland to want a separate nation,” he said. Neither Nagaland nor Jammu and Kashmir has ever been independent nations as they were always part of India. 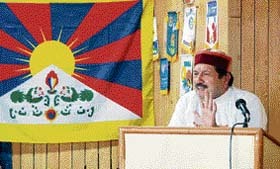 Deputy speaker of the Tibetan Parliament, Gyari Dolma, said it was a historical fact that Tibet was always a free country till it was invaded by China in 1959. “The agenda placed before the United Nations General Assembly in 1949 clearly stated ‘Invasion of Tibet by a foreign country’,” she remarked. China had used repression to crush the peaceful demonstration by monks inside Tibet and people were suffering under the Chinese rule. The Himalaya Parivar passed a resolution for the release of the 11th Panchen Lama, Gedhun Choeki Nyima, who was in Chinese custody since 1995. They also passed a resolution for ensuring free access for Mansarovar yatra to all Indians, stopping of atrocities on peaceful demonstrations inside Tibet. They also demanded that Bhoti being the common language of all Himalayan states should be included in the eighth schedule of the Constitution. The Himalaya Parivar and the Regional Tibetan Youth Congress also took out a candlelight vigil jointly. The scheme under which poor elderly persons were being given a monthly pension of Rs 200 will be worthwhile only if the state governments also provide at least a matching amount if not more. However, this is not the case and many states like Himachal Pradesh, Uttar Pradesh and Bihar, which were only providing Rs 100 per month. There were some states like Goa, which were providing old age pension of Rs 1,000 per month and Delhi Rs 750 per month, Mathew who was in the city in connection with a workshop told The Tribune during an exclusive conversation, here recently. Further, there were over 81 million senior citizens of which 51 million came from below poverty line families (BPL) and required the social security cover. But only 15 million were being covered under the scheme, which meant that more than two-thirds of the needy old persons were still without social security. His own organisation, which was entirely dependent on donations, provided Rs 6,000 annually to 1.25 million persons. Some states like Rajasthan, Himachal Pradesh and Madhya Pradesh have done well on the social welfare sector over the past 10 years, others like Bihar, Jharkhand and Orissa had faltered. The poor old persons had to run from pillar to post to get the BPL card. The government should issue a single card to the old persons who should have all required information like APL or BPL status, age, blood group and other details. All benefits under different schemes should be given on the basis of this card, he suggested. Similarly, providing medical care in the rural areas was another area of concern for the old who needed it the most. Most of them were in no position to go to the towns for treatment. He said the only alternative was to provide mobile medical services. The state governments should acquire mobile medical vans in adequate number so that teams of doctors could send to villages on regular intervals for the convenience of old people. This was the only alternative as doctors were reluctant to stay in villages and as a result quality medical services were not available. Taking exception to the criticism of its leaders by former Chief Minister Virbhadra Singh, state party chief Jai Ram Thakur said the use of such a language against the Chief Minister was highly objectionable. “It is probably his complete sidelining by the high command and loss of political base which is driving Virbhadra Singh to make such derogatory references against his political opponents,” he said. Thakur said it was due to the wrong policies of the Congress regime headed by Virbhadra Singh that the party had lost the assembly elections. “It is due the false promises made to the people and his feudalistic approach which led to the Congress defeat,” he said. He said Virbhadra Singh had tried blame the Congress defeat on wrong ticket allotment but the fact was that people were fed up with his rule. Denying press reports suggesting that there was a shortage of subsidised foodgrains in the state, Dhumal said the government had made available sufficient supply of foodgrains to fair price shops. He clarified that as a firm earlier supplying the foodgrains had failed to maintain quality, the HP State Civil Supplies Corporation had invited fresh tenders for supply of goods. An agreement had been signed with a new firm who had already started supplying foodgrains. The Chief Minister said as per new arrangements, the government would provide malka masar at the rate of Rs 20 per kg, dal chana and dal urad at Rs 25 per kg, and refined and mustard oil at Rs 40 and Rs 45 per litre, respectively. A high-level team of the bank which was in the state capital early this week in connection with the release of the second tranche of the Rs 820-crore development policy loan took notice of the indifferent implementation of the catchment area plans in respect of the hydroelectric projects. It not only underlined the need for speeding up the process but also advised the government to formulate a master plan to effectively address the vital environmental on a long-term basis. Indeed the piecemeal works being carried out for the rehabilitation of degraded areas as part of the CAT plans are indeed not making much impact as evident from the ever-increasing level of silt in the Sutlej. Reckless dumping of debris, vertical cutting of hill slopes for the construction of roads and other developmental projects and large-scale deforestation have destabilised the fragile strata and triggered landslides at several places. Over the next five years a sum of Rs 266 crore will be available under CAT plans for the upper valley in which two major projects, the Nathpa Jhakri project and Baspa project, have been commissioned and six more were coming up. Parwanoo DSP Ramesh Pathania had seized a tanker containing 11,000 litres of kerosene near Timber Trail on April 25. Pathania convened a press conference today. He said kerosene was meant for distribution in upper parts of Shimla by the said depot, but it was transferred in another tanker for taking it for illegal sale in Haryana. According to the preliminary investigations conducted by the police, there appeared to be a big racket involved in the illegal sale of kerosene. Pathania said more details would emerge once Sunder Lal was interrogated. He would be produced in a court tomorrow. As per the inquiry made from the Shimla office of Jagdamba Oil Company, it was learnt that nine tankers of kerosene were sent to it from the Parwanoo office of the Indian Oil Corporation in April alone. While some tankers were shown as “received”, there was no detail of five tankers. The company distributed the kerosene to its sub-dealers located in various parts of the district, but each of them was given less oil than the quota. In papers, the entire stock was shown “received” by the sub-dealers. These transactions yielded around Rs 10 lakh every month. The oil was sent for illegal sale in various parts of Haryana like Panipat, Panchkula, etc. As against the prevailing government rate of Rs 9, it was sold on the black market at prices ranging between Rs 25 and 30. It was also sold to various petrol stations for use as an adulterant. A police team led by Pathania visited Shimla on Saturday and sealed the premises of Jagdamba Oil Company. Its records were being scrutinised. The controller of the Food and Civil Supplies Corporation was also quizzed in that regard. Laxity on the part of the corporation couldn’t be ruled out since no official had physically verified the receipts of tankers reaching Shimla. Pathania said this could only be a tip of the iceberg and more dealers could be part of the racket. Various organisations have demanded that the state government should conduct a fresh survey in the town and review house tax imposed by the municipal council. According to these organisations, residents have been paying ‘electricity tax’ through bills issued by the Himachal Pradesh State Electricity Board (HPSEB). The amount is credited to the MC account regularly for ‘streetlights’. They have also been paying ‘revenue tax’ for the land on which their houses stand. They have also demanded a probe into the allotment of shops constructed for Antodaya families in 1996. Reviewing the assessment of house tax judiciously, taking into account each family’s position, will not only help residents to deposit their house tax sincerely but also boost revenue collection of the municipal council, these organisations maintain. The families possessing houses of area below 100 sq yd and not having any industrial establishment or shop in the town should be exempted from house tax; these organisations have demanded. Six candidates have filed their nomination for the Hamirpur byelection after the last date for submitting the papers ended today. Those who have filed their nomination are: Anurag Thakur and his covering candidate Praveen Sharma (BJP); O.P. Rattan and his covering candidate, Ranjeeet Singh Verma (Cong); Independent Amin Chand and BSP candidate Rattan Chand Kaundal. Scrutiny will be done on May 6 and the last date of withdrawal is May 8. Meanwhile, Hamirpur DC Nandita Gupta has declared May 6 and 21as holidays in all educational institution in view of the preparation for the byelection. The training programmes in all five assembly constituencies of the district, Nadaun, Hamirpur, Bamsan and Mewa, would be undertaken in four phases from May 6 .The constituencywise training programme would be held on May 6, 11, 18 and May 20. Chief secretary Ravi Dhingra reviewed the preparations for the forthcoming Hamirpur byelection at a meeting held here today. He said 1,373 polling stations had been set up. These included an auxiliary booth. A company of Central paramilitary forces would be deployed for guarding EVMs and the election material. He directed the police and the Excise and Taxation Department to take preventive measures to ensure free and fair poll. Chief electoral officer Manisha Nanda said a certification committee had been formed. According to sources, excavation can yield more skulls, skeletons, arms or precious metals as the fort was used for storing treasure by the then kings of Mandi state. A police team inspected the spot today and ruled out any possibility of a recent foul play in the dumping of human skulls there. The fort is in a deplorable condition. Dharampur MLA and former PWD minister Mohinder Singh Thakur said the place had the potential to be developed as a tourist spot. Mandi SP Chander Sekhar said the skulls found in the fort were very old. These seemed to belong to the time of the then kings, he added. All nine accused arrested in connection with Trishana Negi suicide case were produced in a court that remanded them in judicial custody for two weeks. These persons include teachers, students and other employees of the Himalayan Institute of Dental Sciences, Paonta. Their names had figured in the suicide note of Trishana Negi recovered from her room. This information was provided by Paonta DSP V.S. Thakur this evening. He said the accused remanded in judicial custody included Balvinder Kaur (warden of women’s hostel), Navjot Kaur, Aditi, Haranchal, Anoop Kaur, Ravneet Singh (all second-year students), Ajita (first-year student), Upender Singh Dhall (a teacher) and Krishan Kumar Khetrapal, an executive in the institute. Thakur said the case was being investigated on different lines. A teacher and a student named in the suicide note were still at large. Police parties raided some places in Haryana last night to arrest them, but to no avail. Rajinder Kumar (32), a resident of Jukhala, Bilaspur district, was killed on the spot at the Pung locality of Sundernagar town in a road accident yesterday night. According to information, he was coming back around 12.15 am after unloading the clay at the Kol Dam site and when he reached at Pung on the National Highway No. 21 he could not negotiate the tipper no HP-59-1018, which was being driven by him at excessive speed. The vehicle went of the road and he was killed on the spot. Local residents immediately gathered on the spot and tried to save him but their efforts proved futile. The police has registered a case against the driver of the tipper. The body was today handed over to the relatives of the deceased after a post-mortem examination. Lightning killed a newly married couple at Dahar village on the boarder of Chopal subdivision this morning. Those killed were Jagdish, a resident of Heeda village, near Kupvi, and his wife, Kubja. Their marriage had taken place only a week ago. They had come to Kubja’s native village Dahar in Sirmaur yesterday. The purpose behind their visit was to attend the ensuing Haripur Dhar fair. They had stayed in the Kelvi Dichi of the village. This morning, villagers broke open the door of their room and found them dead. Villagers said some animals had also been killed due to lightning in the area. According to Jawali DSP H.R. Kaundal, complainant Madan Lal son of Dhian Chand of Peerbandli village has alleged that the accused had collected Rs 3,400 each from the depositors and failed to pay any returns to the depositors. Chief Minister Prem Kumar Dhumal inaugurated State Veterinary Hospital here today. Equipped with all modern facilities to cater to the health requirements of animals and birds, the hospital has been completed at a cost of Rs 1.72 crore. Dhumal said the state had about 50.50 lakh livestock population which was being looked after by 2,135 veterinary institutions, which included seven polyclinics, 346 veterinary hospitals and 1,765 dispensaries. Spokesman of the BSSP S.S. Guleria said Thakur had been politically active, had tremendous leadership qualities and proves to be fit for leading the BSSP in the state.